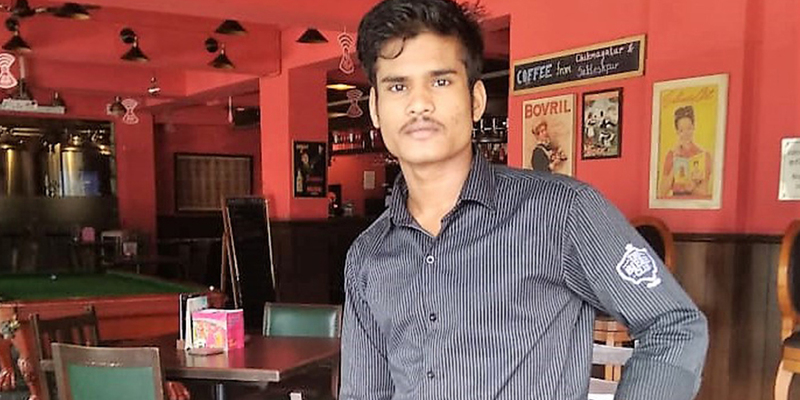 This is the transformation success story of Goutam Senapati, who has successfully completed his skill training in F&B Steward from Don Bosco Tech Society in Bangalore. Most of the time, failure in personal or professional life leads to depression or compels for extreme step of any kind. Despite his economically weak background, Goutham overcame his struggle in every step of his life. He says, “"My mother is a house wife; and my father sells old clothes in weekly market. Since my parents used to go to work and come late in the evening, I attended my school in the afternoon till 6pm and had to study at night after completing the household chores. Both my elder sisters left their education due to our impoverished condition." After three months of training, he got an offer in a 4-star hotel named ‘Biere Club’ and started working in F & B Services with Rs.8000 per month. After two months, he got a hike of Rs 7000 and now his salary is Rs. 15000 per month. Regarding the training, he says, “I don’t know how to express my gratitude Don Bosco Tech. Now I can support my family and continue the study to actualise my dream. One should never give up their studies because of hardship. I feel that failure is only for a short period, but serves as a stepping stone to success."